A COUPLE and their dog will set off on a 30-mile walk to raise vital funds for two local charities. 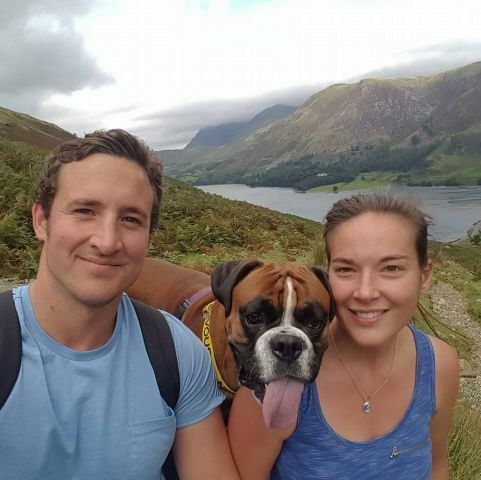 Sara Scott and her fiance Matt Garrett, along with their three-year-old boxer dog Cinder, will take on the challenge in the Lake District next month. The trio, from Bootle, will raise money for the Great North Air Ambulance Service and the Boxer Dog Rescue Northern England, having hit their initial fundraising target in just four days. Miss Scott said: “We’ve always had boxer dogs and we wanted to give something back. “So many people get boxer dogs and then realise they’re not the right dog for them, and this group of volunteers do their best to help out. “The Air Ambulance are incredibly important too. We are out in the sticks in this part of the world and we don’t have good roads if anything does go wrong. Miss Scott has seen first-hand the importance of the Air Ambulance service in Cumbria after a serious fall from her horse Nellie near their Bootle home. She said: “Two years ago I was airlifted to Preston hospital and now I want to do something to give back. “My horse had tripped on Bootle fell and we ended up rolling down the banking together. Thankfully she wasn’t hurt too bad but I was quite bruised and shook up. “I didn’t want to move because you don’t know what damage you’ve done. The trio will set off along an extended route of the Ullswater Way. The 30-mile loop around Ullswater will see them tackle nine of the Lake District fells along the way. The walk will be split across two days, starting on August 11. It took just four days for the couple to reach their initial goal of £500 for the walk, with donations flooding in. Miss Scott said: “Cinder is playing a huge part. She’s quite famous in the boxer dog world. “Unfortunately, she’s just lost her big brother Duke, who we had to have put down. Cinder has stuck to me like glue and we’re both grieving over it. “A lot of people in the community knew Duke and there’s been a lot of donations in memory of him alone. “Matt’s colleagues and friends have been donating too. To donate to the trio’s challenge, go to: https://mydonate.bt.com/fundraisers/cindersaramatt.